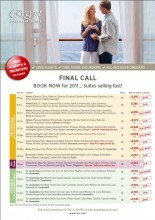 Regent have announce a final call for Autumn and late 2011 cruises. Suites are selling fast and are subject to availability. Please click on the image for full details or call your friendly Deluxe Cruises Concierge team today.